Untuk memahami mengapa dunia kontemporari penuh dengan kesakitan, ingat bahawa manusia tidak mampu berasaskan bukti membuat keputusan. Hi, nama saya ialah Veronika, Saya Jerman dan saya bertemu Hunter tiga tahun lalu di asrama dalam perjalanan saya ke Mexico. Kami bersarapan bersama-sama, bercakap dan ketawa banyak. sebelah petang, saya meneruskan perjalanan saya. Tetapi hanya beberapa kilometer. Kemudian saya pulang ke asrama. mengapa? Kerana saya mempunyai perasaan, . . . Remember that humans domesticated dogs by selectively breeding the dogs that had desirable or human-like behavior. The selection for human-like behavior was sometimes unintentional, such as when our ancestors selected dogs with human-like yawns: dogs and humans are the only species that can catch yawns from the other species. (Caveat: recent research might have found . .. 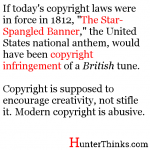 If today’s copyright laws were in force in 1812, “The Star-Spangled Banner,” the United States national anthem, would have been copyright infringement of a British tune. Copyright is supposed to encourage creativity, not stifle it. Modern copyright is abusive. 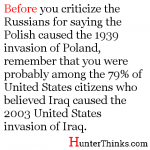 Before you criticize the Russians for saying the Polish for caused the 1939 invasion of Poland, remember that in 2003, you were probably among the 79% of United States citizens who believed Iraq caused the United States to invade Iraq. Links and videos I thought were useful before my new life in the wild.